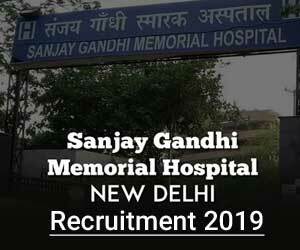 New Delhi: The Sanjay Gandhi Memorial Hospital (SGMH) Mangolpuri has released a notification for 16 vacancies for the post of Senior Residents on Adhoc Basis. The Selection will be done on the basis of Walk-in-interview. Applications are invited in the prescribed format from eligible candidates to fill up the vacant/likely to become vacant posts of Senior Resident Doctors on Ad-hoc basis for tenure of 89 days(further extendable subject to Work & Conduct report)for the following departments in this hospital. The Vacancies are in the Department of Paediatrics, Obstetrics & Gynaecology, Anaesthesia, Ophthalmology, Skin. MBBS with P.G. Degree/Diploma/DNB/MBBS with 2-year exp. as per Residency Scheme in concerned specialty from a recognized University/Institution and should be registered with Delhi Medical Council (with MBBS and requisite postgraduate qualification) or applied at the time of interview. Must have not completed 03 years Senior Residency in any recognized institution either on regular or Adhoc basis. Age shall be maximum of 37 years as on date of interview 16.04.2019. The age is relaxable per norms for Reserved Categories SC/ST/OBC (OBC candidate belonging to Delhi only) and PH category as per rule. The OBC candidates are required to submit their updated caste certificate issued by the Govt. of NCT of Delhi on prescribed format on or before the date of the interview. As per 7th CPC Pay matrix level-11, Pay Rs. 67700/- plus allowances as admissible under the rules. 1. If any post in departments of Paediatrics and Anaesthesia is not filled with candidates having post-graduate degree/diploma/ DNB qualification, the candidates having MBBS degree with two years’ experience in the respective subject may also be considered for these two departments. 2. Reservation for PH as per Govt. norms. 3. In case of non-availability of suitable candidate(s) of reserve category, the seats will be filled by UR Category on Adhoc basis. 4. The tenure of SRs in Eye Deptt will not be extended beyond maternity leave period of SR working on Regular Basis. Tenure: The tenure of Senior Residents is for a period of 89 days including any service rendered as Senior Resident earlier on Adhoc/regular basis in any recognized institution. The appointment will be made initially for 89 days that can further be extended for another spell of 89 days on written request from the doctor concerned and subject to satisfactory performance, work and conduct report from concerned HOD. 1. Upper age limit for eligibility for SR will be 37 years. 2. In case of non-availability of fresh candidates, candidates who have completed 03 years of Residency as Senior Residents but are willing to serve as Senior Residents may also be allowed to appear in the interview. 3. Separate merit lists for fresh candidates and for other (i.e. those who have competed 3 years of Sr. Residency) would be prepared. 4. Firstly, the list containing the names of fresh candidates would be exhausted for appointment and the second list would be considered only after that. 5. All appointments for Resident ship from second list (Under Relax Norms) will be maximum for one year only. It would not be renewable after one year. 1. In the specialties where there is perpetual shortage like radiology, anesthesia, etc or in specialties where no fresh candidates are available, candidates who have completed 03 years senior residency or candidates having experience of 02 years in the concerned specialty (Non-PG) may also be allowed to appear in the interview. The Non-PG may be selected on Adhoc basis only. 2. The candidates who are already in Govt. service should submit a NOC from his/her employer. 3. In case of non-availability of SC/ST/OBC/PH candidates, the post shall be filled by candidates from General Category on Adhoc basis. 4. In case interview for all candidates is not completed on the scheduled date/duration, the interview shall be continued on following working day or fresh date will be announced for remaining candidates. 5. The services of Senior Residents will be governed by Residency Schemes of Govt. of India/Civil Services (Temporary Rules). 6. Candidates are required to bring all original certificates and testimonials along with two passport size photographs on the date of interview. 7. The posts will be filled up in phases as per the availability of vacancies. The number of vacancies, as shown above, is subject to change. 8. Appointment shall be subject to medical fitness & verification of certificates. 9. No TA/DA will be paid for appearing in the interview. 10. Hostel accommodation is subjected to availability. NOTE:- Competent Authority reserves the right to any amendment, cancellation and changes of the advertisement.